Paule Baillargeon photo © 2012 Maurie Alioff. Paule Baillargeon graduated from the National Theatre School of Canada in 1969 and along with Raymond Cloutier and others, co-founded the experimental theatre group Le Grand cirque ordinaire. For several years she participated in writing and performing in its collective creations, which had a marked effect on the theatre of Québec during the late 1960s and early 1970s. Le Grand film ordinaire, which was released in 1971, is a documentary based on the group`s first performance piece. Although disbanned after its second film, her key 1980 film La Cuisine rouge adapted Le Grand cirque’s Brechtian style to a fractured narrative about sexual stereotyping. 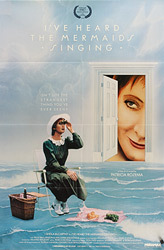 An established actor, Baillargeon is perhaps best known in English Canada for her role as the gay curator in I’ve Heard the Mermaids Singing, for which she won a Genie Award. 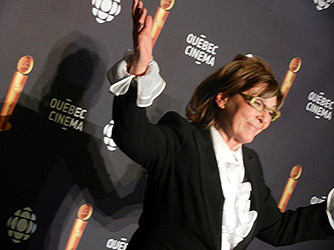 Her handful of directing credits includes the emotionally sensitive documentary about her close friend and colleague Claude Jutra – portrait sur film. Click here to read a review of Claude Jutra – portrait sur film.